Ok, this isn’t coffee, but, it is McCafe, which is coffee. The cool looking van had large see-through windows where you could see 2 different drinks. 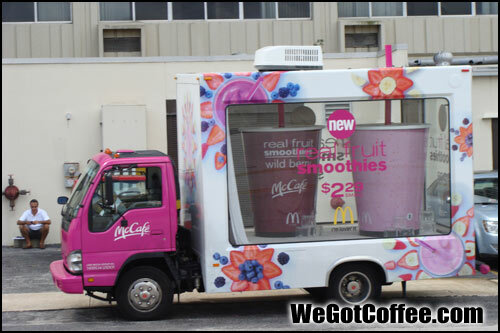 While it wasn’t being operated, it looked like a traveling McCafe which could show up at large public events to sell the non-coffee drinks. 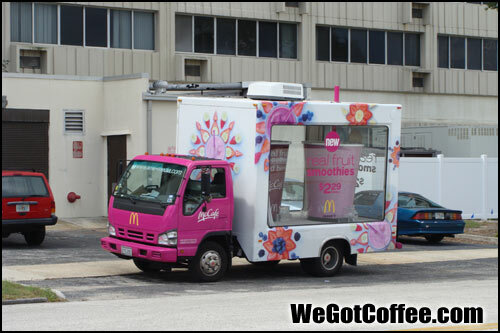 Maybe someday Starbucks will have a coffee van, with cool theme music like an ice cream truck. The van could drive around popular neighborhoods. Instead of kids running out of the house with a dollar, it would be adults running out of the house with a $5 to get a Java Chip Frappuccino on a hot summer day.